Having had experience with the previous version, the Hema HN7, getting the opportunity to get my paws on Hema’s latest and greatest was an offer I couldn’t refuse! So let’s take a look at it shall we? 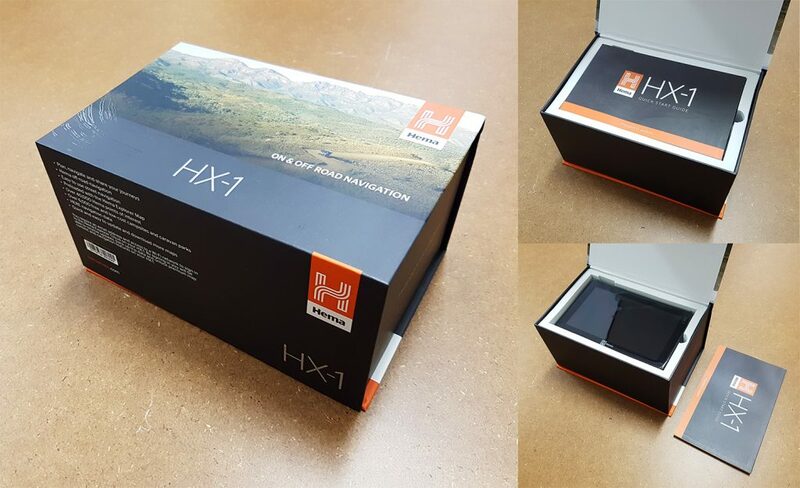 I know it’s a minor thing, but the box the HX-1 comes in shouts quality. And first impressions are important, right. So having a quality box is a good start. Slowly I lifted the lid of the box, hands trembling with anticipation and excitement. My senses heightened and my heart racing… The first thing I see is…. The quick start guide… Ugh. There it is. The HX-1 in all its radiant glory. WARNING: Tech talk below. If you’re not interested, then please skip ahead 5 paragraphs. Built on the Android operating system, rather than Windows CE like the HN7, the HX-1 may not pack a serious punch, but it’s specifications are well and truly enough to achieve what it needs to. I mean really, why over-spec it? With 1GB of RAM, 16GB of internal memory, the ability to add up to 32GB of micro SD card storage, and a resolution of 1024 x 600, it’s more than enough to make the unit snappy and smooth when using it. Plugs and ports include a spot for the SD card, a mini USB2 data port for charging and data transfer to a PC, Bluetooth, GPS (obviously) and also wifi connectivity (WIFI CONNECTIVITY! YES!). There is also an aux port for attaching headphones, or plugging the HX-1 into the aux port on your sound system. Also in the box you get a car charger to plug into your 12V power socket, a USB cable for data transfer as well as charging from a wall plug, a windscreen mount and a nice soft pouch to carry it in. You can also use the pouch to clean your grubby finger prints off the screen. Hema claim that you’ll get 5 plus hours of usage from the battery depending on what you’re doing with it. Well I haven’t tested this precisely, but I can say that you get significantly more time off one charge than you do with the HN7! So there is a great improvement, right there! And the touch screen… Oh… so good. Having a protective tempered glass layer makes it tough. You’ll have to try hard to scratch it, that’s for sure. And being a capacitive touch screen means that the lightest of touches is recognised. It all adds to the usability of the device! If tech talk bores you to tears, then you’ll have skipped forward to right here. So welcome! Now that we have the boring bla, bla techno speak out of the way, let’s get on with it shall we? The HX-1 feels nice and solid in the hand, which is a good thing. It also has a bit of a rubbery grippy surface to it, which is also a good thing. I mean mostly it’ll be mounted on your dash, but those times when you take it out, you don’t want to be dropping it into the mud or onto a rock, right? Turning it on, you’re presented with a quick start wizard which takes you through some of the features of the device, assists you in connecting to your Wifi and helps you register with Hema. If you don’t do these 2 steps now, then you can always do them later. But I’d strongly suggest doing them now. At the least, connect to your Wifi. The Hema HX-1 is packed full of good stuff like Camps 8 information. And if you’re connected to Wifi then updating the HX-1 is such a simple process, it’s not funny. Performing updates to the HN7 was basically a nightmare. Updating the HX-1 is the opposite end of the spectrum. So do yourself a favour. When it’s all done, you arrive at a very well designed and intuitive Home screen. I won’t explain what each of the icons do. That’s what the quick start guide is for! But I’ll give you a tip. If you’re after more detailed help, then a complete help guide is available to you by pressing the little question mark on the home screen. Drive – This is the on-road turn-by-turn navigation system running on iGo. So very similar to the previous Hema navigators and very intuitive. 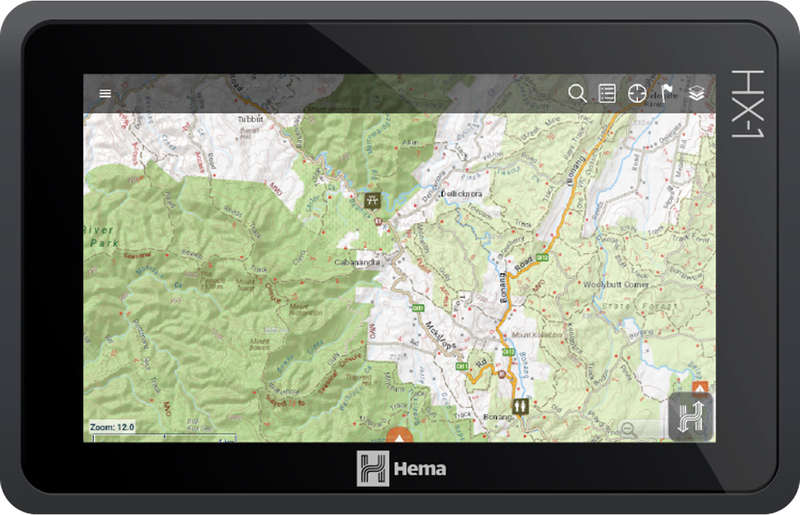 Explore – This is the offroad Hema maps. No longer a cut down version of OziExplorer, this is Hema’s own software, using Hema’s top quality maps. Media – This buttons launches the camera app. You can take photos and video and explore your media library from here. Now one of the huge improvements that Hema have made with this device is that it’s able to multitask, i.e. run more than one program at once. With the HN7, if you were in Drive mode but then wanted to swap to Explore, you’d have to quit back to the home screen, then open Explore mode. 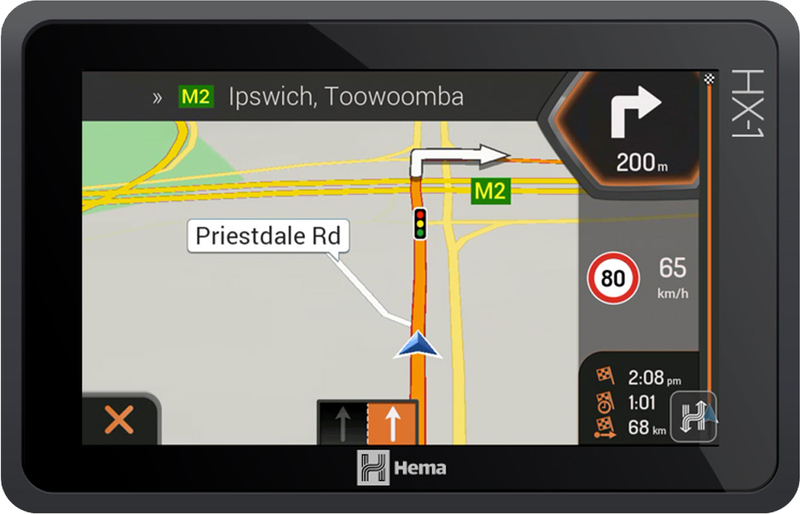 With the HX-1 it’s quick and easy to swap between Drive, Explore, Help and Media/Camera by using the Hema Nav button. One thing that you can’t do with the HX-1 is hook it up to a reversing camera. The HN7 did have that functionality but that’s been removed from the HX-1. And out and about with it, I did find the screen to be very reflective, making it more difficult to see things. It was manageable though. If there was some kind of shade cover thing, maybe that might help. When you tap on Drive, it launches the iGO turn-by-turn on-road navigation software. If you’ve used the HN7 previously, or pretty much any turn-by-turn software then it’s very intuitive. So I won’t spend forever telling you how it works. What I will do is point out some of the cool features that might come in handy. One of these features, is the ability to navigate to a photo. So let’s say you’re out and about and you see something unreal. You can take a photo of it with the HX-1. The HX-1 tags the photo with the GPS location of where it was taken. So using cleverness, it’s then possible to navigate back to it using the HX-1 simply by selecting that option from the New Route menu. This feature doesn’t seem to be 100% reliable though. I’ve taken a couple of photos but Drive will only give me one to navigate to. Perhaps an area of improvement for a later update. Also on the main menu, is Useful Information. This gives you very quick access to a bunch of info, including “Help Nearby”. This allows you to quickly navigate to police, health care, petrol stations etc. Very handy! 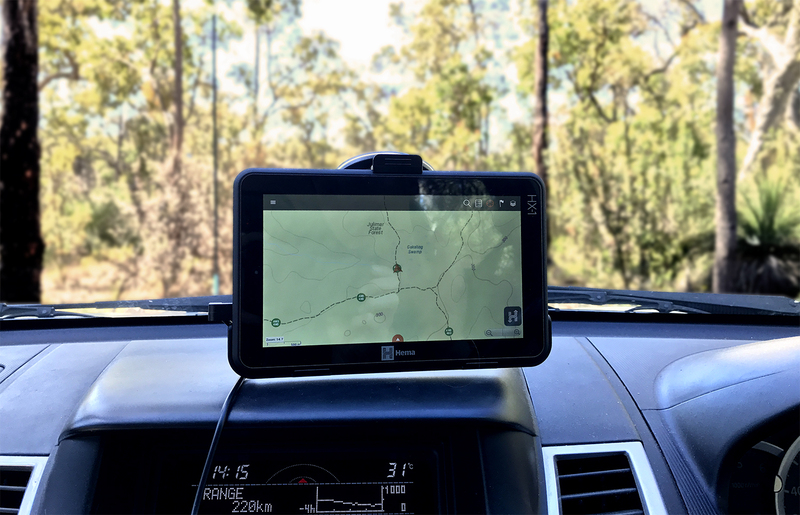 Tapping the Explore button will launch Hema’s off road navigation app loaded up with the Hema Explorer map, featuring 1.2mil kms of tracks and roads for you to explore. Plus more maps to download if and when you need them! Once again, I’m not here to teach you how to use this software. But I’ll point out the cool bits. Being a touch screen is one thing. The HN7 was a touch screen device. But the HX-1 supports multi touch! Huh? So can 2 people use it at once? Welllll… not really… What it means is that can use 2 fingers instead of just one. “So what?” you might say. Well it does make zooming in and out easier. Pinch to zoom in, and un-pinch to zoom out. And now that everyone uses smartphones that have this functionality, it just makes sense that Hema would bring it to the HX1 as well. Using one finger smoothly scrolls the map as well. Way better than the HN7 in this respect! Anytime you want to, you can move the map around to see what’s coming up on your track. And to return the map to centre on your position, just tap the GPS target icon in the top right of your screen. Downloading extra maps is a breeze! Just click on the Layers icon in the top right and scroll through till you find the map that you need and download it. You can then slide it up and down to choose which maps appear in which order. One thing that disappoints me greatly is the distinct lack of anything specifically Western Australian… What’s up with that, Hema!!?!? We have tracks too you know! I contacted Hema about this and it’s in their pipeline. So hang in there Western Australians! Having said that, the built-in Hema Australia map is fantastic for WA. But it’d be nice to have options, that’s all. I have found a couple of quirks with Explore. Only minor things that I’m sure will be cleaned up with future updates. If you’re navigating to a waypoint, to cancel nav you can pop up a little menu and hit the X. But you have to hit the X juuuuusst right otherwise it won’t work. Also, I’ve created a route to help me get out to the very tip of Cape Peron in Shark Bay WA. I just did it as a test and now I want to delete it. But there is no way to do so. I mean there is a huge “delete” button, but tapping that does nothing. I’m sure there’s a way, but it’s not obvious or just plain doesn’t work. Yep I’ve logged a ticket with Hema support for this. Edit: Their response? Log onto Hema Cloud with the same details you registered with during the initial setup. Once you’re there, delete the route, and then also delete it from the HX1. So a quirk that I’m sure they’ll sort out down the track. Well this is a bit disappointing. But then it’s a navigator, not a camera, right?! I find that the camera is slow to respond and the light balance is bad, but it’s usable if you want. I mean it’s ok for taking quick snaps/videos that you can link to waypoints to remind you of what was there, but you’ll be disappointed if you rely on this camera for all your holiday snaps. In fact, in the built-in help on the HX-1 itself, the tech specs of the HX-1 doesn’t even list a camera at all! And the help contents page has links to Drive, Explore, Home, Getting Started… but there is a distinct lack of Camera/Media… Hmmm… Looks to me that Hema aren’t all that proud of the camera feature. What do I think of the Hema HX-1? There are heaps of other things you can do on the HX-1 that I haven’t covered, but this isn’t an article to teach you how to do stuff. Check back for some ‘How Do I’ type articles that will be coming soon. But what do I think of the Hema HX-1? Well I think it’s a step-change in usability. The HN7, Hema’s previous offering was great, but in my opinion, very clunky to use. The touch screen wasn’t great, the keyboard wasn’t great, updating the device was a thing of nightmares! The smooth response to touch, the intuitive user interface, the look and feel of the HX-1 makes this device a joy to use. At the Home screen, and in Explore, turn the HX-1 from portrait to landscape and the screen re-orientates itself to suit. Try different touch types. Quick taps, long touch/holds and see what they do. It’s all just so danged intuitive! One concern I do have is that the device automatically checks for updates when it’s connected to WiFi. And this could incur data charges. Maybe an option to turn off auto updates would be a good thing in a future update. Sure, there are quirks. Sure there are a couple of things that could be improved. But it’s a brand new device. And the response I’ve had from Hema support has been fantastic. I feel confident that they’ll work hard to keep the improvements coming. This thing will only get better and better. Does all this sound good? You can purchase an HX-1 from here!